Information on prizes and how to enter form part of these Conditions of Entry. 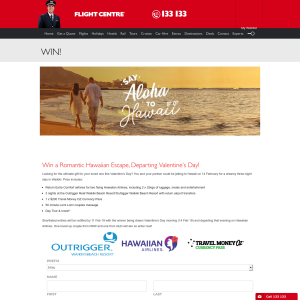 To qualify for the draw, persons must visit www.flightcentre.com.au/deals/win and complete the entry form. Details of Prizes- there are 2 prizes, one departing Brisbane and one Sydney Return Extra Comfort airfares for two flying Hawaiian Airlines, including 2 x 32kgs of luggage, meals and entertainment 3 nights at the Outrigger Reef Waikiki Beach Resort/Outrigger Waikiki Beach Resort with return airport transfers 1 x $200 Travel Money OZ Currency Pass 50 minute Lomi Lomi couples massage ($250 spa credit) Couples Day Tour.